Here at the Fort Wayne Visitors Center we are proud to say that we carry a variety of holiday gifts which you cannot purchase anywhere else. This year we have dramatically added to our prepackaged gift options to aid in your holiday shopping, in addition to the products we sold last year. They come beautifully assembled and gift wrapped for your convenience. Each option falls at a different price point so you will get the WOW! factor no matter your budget. We have two different gift sets which come in coffee cups. 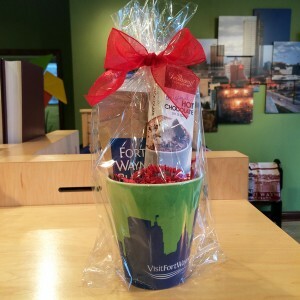 The first is the Visit Fort Wayne mug (available in blue or green) with Hot Chocolate on a Spoon by DeBrand Chocolatier which is $9.75. 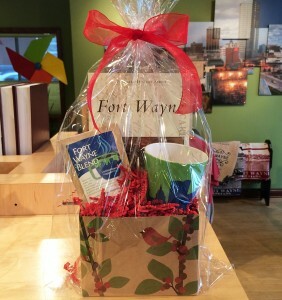 The second is the Fort Wayne Skyline Mug with Fort Wayne coffee and Hot Chocolate on a Spoon for $15. We also have a variety of gifts housed in festive holiday boxes. Our first contains the Visit Fort Wayne coffee mug, Hot Chocolate on a Spoon, Fort Wayne coffee, and a handmade coaster and ornament from Hedgehog Press. This beautiful assemblage is perfect for a Secret Santa gift at $20. Additionally, we have gifts geared towards the reader or child in your life. The first contains the Skyline mug, Fort Wayne coffee, and a book on Fort Wayne history at $30. For the child in your life, we have a combo that contains a colorful teddy bear, slinky, light-up yo-yo, and light-up bouncy ball for $17.50. All of the contents in these packages are sold separately if you wish to create your own special gift. We also have gift bags and tissue paper for your gifting convenience. We cannot wait for Holly Trolley and will be open for shopping on Saturday, November 29th. Come in between now and the end of the year and mention Holiday Code to receive 20% off your entire purchase. AND, just for Holly Trolley, a flash sale of our vintage inspired Fort Wayne t-shirts for just $10 each! 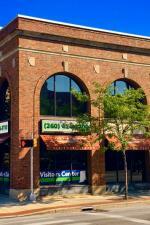 Visit us in person at 927 S. Harrison Street, or online at shop.visitfortwayne.com. You can also call us anytime at 260-424-3700.